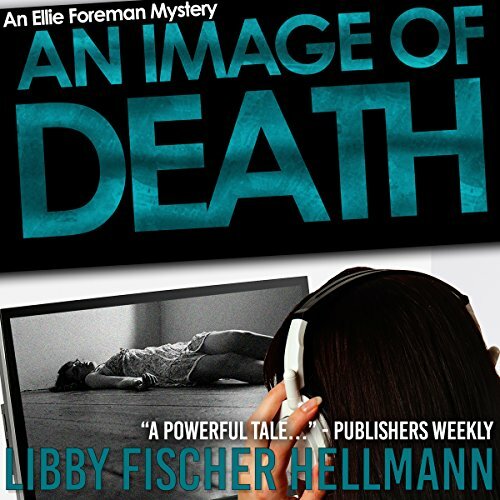 Chicago filmmaker Ellie Foreman is back, and she's tackling her most dangerous case yet in this dark amateur sleuth thriller from critically acclaimed crime writer Libby Fischer Hellmann. Ellie's latest outing as an amateur sleuth comes hot on the heels of Libby Fischer Hellmann's 2002 Anthony-nominated thriller An Eye for Murder and the 2003 Picture of Guilt. Packed with memorable characters, and neatly tying together a number of gripping plotlines, An Image of Death has been praised by mystery fiction fans as insightful, compelling and entertaining. I was given this book in return for an honest review. I love mysteries, this book is not exception. A woman is murdered and Ellie, a videographer and mother, gets a video of it in the mail. She hesitantly takes it to the police even though she doesn't trust police. Why was this sent to her?? That's what the police want to know and so does Ellie. Since Ellie has a history of getting involved in things that she shouldn't, she is warned by the police to stay out of it. She of course doesn't listen, and this the book unfolds. This is not just a mystery, it has back stories, and side stories that involve her adopted husbands thirst for knowledge of his family among other things. This book has murder,mystery, intrigue, deception and wonderful characters that you will be rooting for. A must read for mystery lovers. Nan McNamara was very good with the delivery of the story. Well written, realistic murder mystery. The narrator was very good, well paced, good characterizing and tone variations. Why is it not my type of book: no humor, no real excitement or action. I found it boring, predictable and drawn out. If you prefer a realistic murder mystery with out humor or action, this is for you. It's difficult to believe these people would really make these decisions and behave this way, but forgiving the author her use of poetic license, this is an exciting, suspenseful mystery. The romantic tension between Ellie and David gets a bit tiresome -- instead, I wish the daughter's character was more fully developed. Nan McNamara gives the characters distinct and appropriate voices. It's a good match of narrator with story. I continue to enjoy this series. I enjoyed this. This is my first Ellie Foreman mystery. While it was obvious there was previous "history" for Ellie, it didn't detract from the story which kept my attention. I enjoyed learning about the history of the characters and how the different pieces of the puzzle came together - especially such dissimilar parts as blood diamonds, the breakup of the Soviet Union, the search for family after long after the Holocaust and foster children. I'd like to read more about Ellie ! I would recommend any & all of Libby's books. I am always impressed by her attention to detail. (A result of her extensive research, I'm sure). What other book might you compare An Image of Death to and why? While I'm at a loss for a direct comparison, I will say that it's a match for any well-written intriguing, suspenseful story. I enjoyed the story line & the narration, but I discovered that I don't particularly enjoy being read to. I'd rather be the reader! Ellie is a video editor so it isn't unusual for her to review videos. However when she finds a video on her front steps one night and starts looking at the video she is shocked to find a video of a young woman being murdered. The police have nothing to go on as they try to figure out what who this young woman was and why anyone would want to kill her. As Ellie starts digging, just for her own peace of mind, she discovers a mystery and a crime circle that covers multiple continents. Will Ellie find the killer before the killer finds her? I received this book for free from AudioBlast in exchange for my honest review. I enjoyed that this tale of murder was told from the victim's POV. It's chalk full of sleuthing and questions with intrigue. A worthy listen and intriguing story. What does Nan McNamara bring to the story that you wouldn’t experience if you just read the book? She makes the characters pop and is great with accents. You never know what's waiting for you around the corner. This is a well-crafted story and may be the quickest audio book listen that I’ve ever done. It helped that it takes place in and mentions locations that I’m intimately familiar with. I wanted to keep listening not only to find out what would happen next but to hear where it would take place. The story centers around Ellie Foreman (Wonder if the name came from the old Foreman motors? ), a film producer, who is dragged into a murder when a video tape, showing that murder, is dropped off at her house. Ellie has had some trouble with the law in the past, so is a little squeamish about calling in the police, but she does. Ellie is also unwillingly pulled into making documentaries about foster children and construction ground breaking despite her insistence that she isn’t a documentary maker. From there, things escalate as we learn details about the murder as Ellie digs up clues that involve the Russian version of organized crime. On more than one occasion, her life is put in jeopardy. The story is quick moving, if a bit dated from a technology point of view. Parts of the story take place at the time of the break up of the Soviet Union and parts at the start of the 21st century. The events as they unfolded kept me listening, The story line is clearly set up for a sequel, but the book is complete, there are no cliffhangers or any blatantly unfinished business.. I received this book as a gift and almost stopped listening before hitting chapter 2. Ellie came across as so incredibly whiny and dislikable, that I almost gave up. Luckily, I didn't as that only lasted for the first chapter or so. Past that point, the narrator did a remarkable job in holding my attention. Her skill with various accents is laudable. While I was able to figure out the who behind the ending, if not the specifics, that didn't bother me. Overall, this proved to be very entertaining listen. I’ll happily recommend this to my mystery-loving friends and will be seeking out other Hellman books. Ellie Foreman receives an unsolicited video by an unknown person at her home. She is an independent producer of industrial videos and thought it may pertain to work. Instead, what she receives is what looks like the murder of a young woman in some basement. Thus begins her desire to find the truth. Meanwhile, in Russia we learn of the lives of two friends, Mika, and Arin as the Soviet Union crumbles and their lives change drastically. How these two stories come together, I found interesting. This is a slow moving mystery and not a fast paced thriller. As the stories development, we get to know what makes Ellis tick and what she deals with on a regular basis. But since is the third installment of the Ellie Forman mysteries, I found I was lacking in knowing her backstory and why she was so paranoid at the beginning. Other than that, I enjoyed how it all seems to mesh and make for a satisfying story.